This herb consists of the gum resin obtained from the woody stem of Commiphora myrrha Engl. It is produced mainly in Africa. Properties & Taste: Bitter and neutral. Meridians: Heart, liver and spleen. 1. For dysmenorrhea, amenorrhea, stomach and abdominal pain, and traumatic pain, it is used with Gummi Olibanum (Ru Xiang). In treating arthralgia, Gummi Olibanum (Ru Xiang) is used rather than Myrrha (Mo Yao). In treating pain due to Qi and Blood Stasis, the two herbs are used in combination to produce better effects. 2. 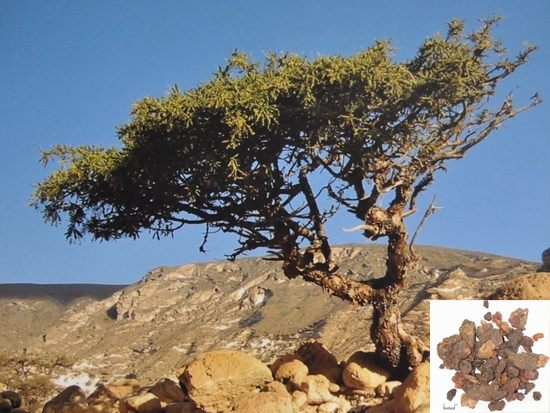 The indications and combinations of Myrrh (Moyao) are the same as those for Frankincense (Ruxiang). Dosage: 3-10 g, decocted in water for an oral dose. Appropriate amount for external use. Cautions & Contraindications: Contraindicated during pregnancy in cases of excessive uterine bleeding.